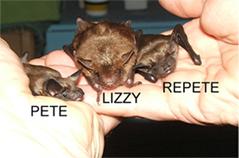 GOING BATS is a rehabilitation residence for injured or displaced bats. Bats found by the public, whether injured or simply in the wrong place, are treated and cared for until they may be safely released. Now in our nineth year of operation, we have received 880 bats with an additional 102 born in captivity. To date over 710 bats have been returned to the wild. We aid homeowners by rescuing any errant bats and provide suggestions on how to exclude or encourage bats. Additionally, about 50 presentations about bats are made annually to schools, garden and nature clubs and other groups in NE Indiana. There is no charge for any of our activities. GOING BATS is located in rural Allen County, Indiana, north of Ft Wayne. The facilities consist of a bat room, once the dining room of our 19th century brick farmhouse, and a flight pen in a bank barn which also houses a nursery colony of wild bats. Ann Walton, a retired special education teacher, and Bob Walton, a retired electrical engineer, are the main rehabilitators. In addition to a very caring veterinarian, a number of other volunteers pitch in to allow some vacation time. Karen Silvers, a new rehabber has been trained to provide additional support.